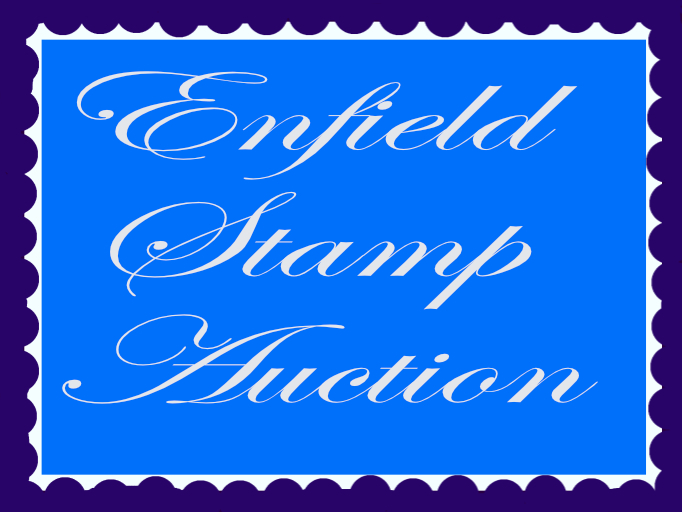 Enfield stamp auction 1001 ending 24th Nov.'18 - Enfield Stamp Company Ltd.
19 1928 VLORE to BRINDISI Air Service Ovpt.set,M.,small HR.,fine. 50 1953-62 1/2c.to $4.80 Defin.set with 1c.shade,M.,good to fine. 55 1938-53 10s. black & bright purple,Perf.13,M.,HR.,good to fine. UM.bl.4,with central Gutter & marg.at bottom with ASH Imprint. 80 1891 24k. dull blue,Perf.11,12 or 13 line,UM.(2),M.,Bl.4,fine. 86 1933 50g.+ 50g.ultramarine & ultra.paper(granite),WIPA,M.,fine. 132 Express Letter:1931 2Fr.45 myrtle-green,M.,faint hinge mark,fine. 137 1894 10Fr. black & green,U.,parts of two cds.,one corner Perf. 141 1938-53 2s. deep purple & ultra.on grey-blue,chalk surfaced,Perf. 145 1938-53 2s. purple & deep blue on pale blue,ord.paper,M.,fine. 155 1950 12/6d. grey & pale orange,(chalk surfaced),Perf.13,M.,fine. 207 1967 Decimal Currency opts to $1 & 10s.on 10d. (No 10c.),M.,good. 220 1882 20 ore dull blue,(small figures),U.,ring target Pmk.,good. 222 1875 32 ore yellowish-green,Perf.14 x 13 1/2,M.,heavier HR.,good. 234 P.Dues:1886-87 1Pi. rose-red,No Wmk.,Perf.10 1/2,UM.bottom marg. 251 1878-99 6d. dull rose,Perf.11,M.,one missing Perf.at right,good. 266 1849-52 1Fr. (deep)carmine,Imperf.,U.,light grid Pmk.,huge marg. 268 1849-52 1Fr. (deep)carmine,Imperf.,U.,light Pmk.,two huge marg. a stamp with huge even marg.all round,extremely fine.Exceptional. 285 1916-19 1Fr.lake & yell.-green,G.G.paper,M.horiz.pair,full marg. 286 1926-27 50c.on 1f.05 verm.,bl.of four,UM.(2),M. (faint mark),fine. 289 1929-33 20Fr. deep red-brown,Pont du Gard,Perf.13,U.,cds.,fine. bl.10 from bottom of sheet with marg.three sides),very fine.(Bl. 318 1843 1c.to 1f. (No 15c.75a.) “GOLFE DE BENIN”,M.,HR.,good. (11) SG. 319 1894 1c.to 5c.,30c. (missing corner Perf.)40c.,75c.,M.,HR.,good. 324 1910 Defin.set to 45c.inscr.”CONGO FRANCAIS GABON”,M.,HR.,45e. 331 1928 Child Welfare set(ex.40c.+40c. ),in blocks of four,UM.,fine. 357 Officials:1919 Ovpt’d”Volksstaat Wurttemberg” set,M.,HR.,fine. 399 1908 5c.on 5Pf.to 100c.on 80Pf.Ovpt.set,U.,cds.,fine. 100c. 406 WITTENBERG – LUTHERSTADT:1946 4Pf.on 20Pf. pale blue,UM.,fine. 414 1960-62 Defin.set to 2s. (inc.diff.shade of 2 1/2),UM.,very fine. 449 4d. rose-carmine,Wmk.large Garter,U.,crisp 545 Numeral Pmk.,fine. 462 1s. green,Wmk.spray,Pl.4,U.,central 1872 cds.,left marg.,fine. 466 10s. grey-green,Wmk.anchor,white paper,U.,small part of Reg.Pmk. 508 2d. pale grey-green & scarlet,chalky paper,UM.,top marg.horiz. corner blocks of six,one showing white spot on forhead(Pl.4,R. 638 1912-24 1d. scarlet,booklet pane of six,up.Wmk.,M. (1)& UM.,good. 640 1912-24 1 1/2d.red-brown,booklet pane of six,Wmk.up.,M.,Perfs. 654 1950-52 1d. ultra.,booklet pane of three with three labels,Wmk. 708 LESBOS:1912 5Pa.& 1Pi. Stamps of Turkey Ovpt’d T.1,Unused,good. 721 1882-96 10c. deep blue-green,Wmk.CA.,U.,central CANTON cds.,fine. 722 1921-37 2c.to 5c.,8c.orange,12c.,20c.& 50c.,Wmk.Script,M.,fine. 727 1902-04 5k. slate & chestnut,M.,centred slightly to bottom,fine. 739 1940 N.Y.World’s Fair,Ovpt’d 1940,M.,very light hinge mark,fine. 768 1911 Arms Ovpt’s,”Relais”(Tehran Local Horse Post),M.,HR.,fine. 816 1922 set to 85c.,Ovpt’d,M.,mixed centring as usual,good to fine. 860 1999 L.£10,000 Surch.on Papal Visit,U.,large violet cds.,fine. 882 1863-81 1/2d. orange-buff,Wmk.Crown CC.,Perf.14,Unused,HR.,good. 910 1934 1d.+ 1d. “Crusader” Health,horiz.pair showing curious ptg. 914 1895-1900 1/2d.black,Perf.11,Wmk.inverted,block of four,UM.or M.
941 1934 7d. Trans – Tasman Air,M.,tone spots on gum,good appearance. 976 1949-53 1 1/2a.to 6a.,12a. Redrawn issue,UM.,12a.M.,good to fine. 999 1864 50r. blue-green,(LUIS),U.,”168″ Numeral Pmk.,four marg. 1000 1862-64 100r. dull lilac,Imperf.,U.,four clear even marg.,fine. 1012 1939 President Carmona’s Presidential Tour Ovpt.,M.,good to fine. 1018 1864 6p. rose-carmine,wove paper,Unused block of four,four marg. 1024 1866-67 2p.,5p.,2p. (B),on thin paper,M.,HR.,all four marg.,fine. 1026 1869 50b. red & pale blue,Imperf.,U.,light Pmk.,four marg.,fine. 1045 1983 King Fahd MS.,UM.,fine. (1) SG.MS.1348 See footnote in SG. 1046 1983 Crown Prince,UM.,fine. (1) SG.MS.1353 See footnote in SG. 1057 1893 12c.on 16c. (D.I & D.II),15c.on 16c. (D.I & D.II)90c.on 96c. 1d.& 1 1/2d.,but with complete 1/2d.,1d.& 1 1/2d.panes too,good. 1101 1858-72 50 ore deep lake,U.,light cds.,very well centred,fine. 1114 1882-99 3c. purple-brown,Granite paper,Wmk.8(impressed),M.,good. 1131 1923-30 40c. blue & green,chalky paper,grilled gum.U.,cds.,fine. 1143 1932 30c. grilled gum,U.,light machine Pmk., good to fine. 1160 1923 Defin.set to 20p.,add Ovpt’d with T.5,M.,HR.,top two vals. 1165 1924 1/4 green,Ovpt’d T.17,Bl.4 showing two Tete Beche pairs,up. 1179 1918 P.O.W.,15c.on 5Fr.set(No 15c.on 35c. ),M.,HR.,good to fine. 1188 1861-62 30c. deep orange,U.,cds.,one very slightly blunted Perf.